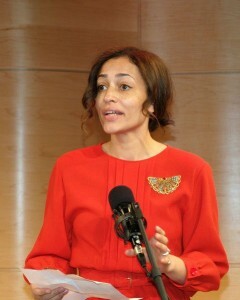 Zadie Smith grew up in Willesden Green, England. She was born into a mixed race family; her mother is from Jamaica, and her father is English. She has two brothers, both younger than she, and two older half-siblings. Smith began writing poems and short stories when she was six. In addition to writing, she loved music and she tap-danced for ten years. One of her favorite pastimes as a kid was watching musical movies. Her aspirations to become the next Ginger Rogers were set aside by her growing interest in writing. Perhaps it was her desire to resist conformity that prompted Smith, at age 14, to change her name from Sadie to Zadie. In high school, Smith was not an exceptionally ambitious student. She spent the majority of her free time reading and hanging out with friends. She smoked marijuana and characterizes herself at that time as being “a bit of a stoner” (Lyall). In fact, when Smith told one of her high school teachers that she was going to apply to Cambridge, her teacher dismissed the idea as ridiculous (Lyall). But Smith did make it to Cambridge, to the surprise of her colleagues, and found her niche amongst the academics. In college, Smith spent the majority of her time reading up on the techniques and aesthetics of her favorite writers. Her curiosity proved useful as she researched historical accounts in order to write White Teeth. In one interview, Smith was asked how she so effectively captured the perspective of a Jehovah’s Witness, or the thoughts of a middle-aged man. Smith responded, “Books, books, books. As far as I’m concerned, if you want to find out about the last day of World War II or the roots of the Indian Mutiny, get thee to a books catalogue” (Lyall). Although Smith knew she wanted to pursue writing as a career after college, she never took a creative writing class. Her major, English Literature, provided all the inspiration and learning she felt she needed to pursue her goals as a journalist. In fact, when Smith was preparing to graduate from Cambridge, she sought numerous jobs in the field of journalism. Astonishingly, she was not offered a single interview (Lyall). Nonetheless, Smith was able to succeed as a writer, publishing White Teeth, her first novel in 2000, immediately after graduation. After the publication of White Teeth, Zadie Smith was awarded the Whitbread and Guardian prizes for a first novel. She also attracted the attention of Salman Rushdie (Satanic Verses, The Moor’s Last Sigh) who lauded Smith’s work as “an astonishingly assured debut” (White Teeth). Smith has been compared with Rushdie, but she finds this comparison flawed (Hattenstone). Rushdie and Smith both address issues of race, history, and gender, but Smith’s writing style is clearly different from that of Rushdie’s. In the media frenzy that followed White Teeth, Smith struggled with her new-found fame. Because of the social and political import of her novel, Smith was encouraged to become a spokeswoman for sociopolitical issues by the media and literary critics. Smith laments, “I was expected to be some expert on multicultural affairs, as if multiculturalism is a genre of fiction or something, whereas it’s just a fact of life — like there are people of different races on the planet” (Hattenstone). The media’s reaction to White Teeth was almost overwhelming for Smith. Although she enjoys the attention, Smith feels that to a certain degree, her reputation of being a great new novelist is unearned. Smith is her own harshest critic. White Teeth, despite its critical acclaim, has left Smith wondering what all the fuss is about. She states, “I have great ambitions of writing a very great book, I just don’t think this is it” (Lyall). White Teeth takes place in London, home of Archie Jones and Samad Iqbal. Jones (English) and Iqbal (Indian-Pakistani-Bangladeshi) form a strong friendship when they meet during World War II. Their friendship spans several decades, during which both marry and have children. After a divorce from a tumultuous first marriage, Jones contemplates suicide, but his demise is narrowly averted. That same day, Archie Jones meets Clara. Seeking escape from the strict rules of her Jehovah’s Witness mother, Clara marries Archie in a matter of weeks. Together they have a daughter. Meanwhile, Samad Iqbal struggles with his fate — a second-rate job as a waiter, and the Muslim faith with which he is constantly struggling. White Teeth forces the reader to question his or her beliefs and opinions on racial discrimination, miscegenation, gender roles, and history. It is a lengthy but witty novel, that demands a thorough reading. “I express myself with my friends and my family. . . . Novels are not about expressing yourself, they’re about something beautiful, funny, clever and organic. Self-expression? Go and ring a bell in the yard if you want to express yourself.” (Hattenstone). “I was 21 when I wrote White Teeth, what difference does it make what I think?” (Hattenstone). “I have an ambition to write a great book, but that’s really a competition with myself. I’ve noticed a lot of young writers, people in all media, want to be famous but they don’t really want to do anything. I can’t think of anything less worth striving for than fame” (Hattenstone). Smith, Zadie. White Teeth. New York: Vintage Books, 2000. Smith, Zadie. White Teeth. London: Hamish Hamilton, 2000. —. Autograph Man. London: Hamish Hamilton, 2002. —. Changing My Mind: Occasional Essays. New York: Penguin, 2009. —. On Beauty. London: Hamish Hamilton, 2005. —. NW. London: Penguin, 2012. —. Swing Time. New York: Penguin, 2016. White Teeth takes place in London, home of Archie Jones and Samad Iqbal. Jones (English) and Iqbal (Indian-Pakistani-Bangladeshi) form a strong friendship when they meet during World War II.